This guide will discuss few things about the game that will help you develop a better start, or carry on what you do in a better way, from how to choose skills, to finding the gear, weapons you want, along with covering few thing about the market, plus how to do quests efficently, and as fast as possible with reliable tips on what to look for, and the key words to search in each quest. Boss Slaying (Efficient Experience Grinding). How to Play Online with Friends. 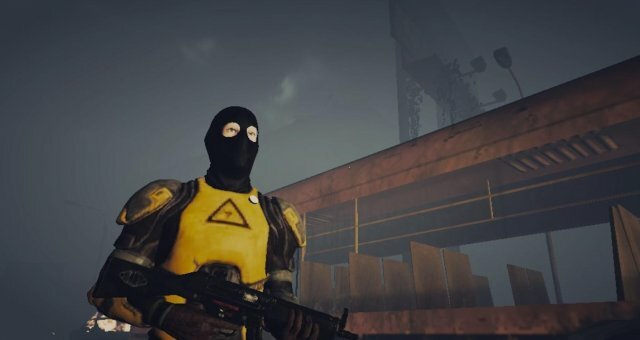 You start the game with damaged weapons and gear, that you will eventually get better items from looting or market, but as a starter you would be better off going with looting for now to have better understanding of the game mechanics, and be familiar with the game itself and how it works. A basic RNG loot based drop. Most common thing to see is players keep looting things, which is basically a fair thing to do, but they end up picking up useless things, or dropping an important item they may not be aware of, and that can be a game changer for them in many ways even if low level loot. We can't deny that many low level items can contain either good or bad stats, but let me show in pictures better and explain below them what i mean in the common mistakes sub section below. But before that, the bonus round goes for... Market selling items, which is 20 slots, in each outpost so thats 60 slots, you can turn these to inventory instead of selling in market, put the items there, and set a high price for them, TADA! Example of picture above, these common items give literally 0 stats, on top of that taking inventory slot from you that you can use them for better items to keep. 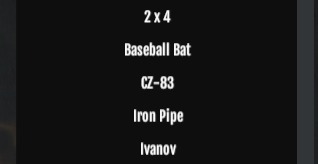 As long as you won't replace them with a current item, that they can be better, maybe an upgrade from ivanov to Cz pistol, use CZ and drop the ivanov, that is in the case if both were common. This goes for almost everything except for melee weapons, you may keep the one you're using till you find a better one depending on attack speed, for example you don't want a slow speed melee, and rather stick to faster ones. Most common one and it can be punishing as well. 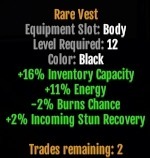 most players go like " WOW i got this rare vest, i will throw my superior since it is lower grade" WRONG. Quality doesn't matter when it comes to "superior, rare, and elite" as much as the stats they provide. Sure that higher quality provides more stats, but are they useful? let us see and compare these 2 items seen above and see their actual stats. We can see that Superior providing a better stats since it has one of important stats -% incoming damage, additionally 10% inventory, while vest has 16% inventory, while the other stats aren't that important. Yet this can have many different preferences, some players may want only inventory slots to maximize the stat, others want average slots and better survivability from damage reduction, which experienced players can choose easily, but this just an example to show that quality doesn't mean better stats, regards of item levels. How to Pick Your Skills? This is an important question and to answer it, it will take sometime from the player to realize which playstyle they like so they can utilize their skill points. Example: a player who likes to use shotgun only or guns only, they will utilize their skill point for example on shotgun expert to get the most out of their shotgun and their favorite playstyle, along with other skills that they favor. Some others may prefer to loot, and here we can look at 2 skills that many of us picked on the first few days, looter and mule, why? search speed is increased, along with mule providing 2 slots per lvl up, up to 8 slots at lvl 15 where you can unlock highest/max tier of each skill. Overall you can max up to 5 skills at level 20 and have them maxed at tier 4, or you can run several skills, which may not benefit you much, but it sll depends on your build, the items you have as well, and how much boost to the skills they can give as some stats are capped at 100%. This is where prestige plays the big part, getting experienced with the game, u know what you have, what you want to get, so maybe you ruined up your first 20 levels, but dont you worry, there are still 4 more prestiges you can go through and experience a better playthrough with you being experienced on what flaws you had, and trying to fix them. These also play a big role as they have stat boost either individually or globally, in weapons part at least. Example: Weapon headshot damage. This applies to the weapon itself. While Headshot damage applies to both of your 'guns' as melee dont have headshot damage. Always check every outpost for the item you're looking. Every outpost have different prices on certain items, e.g: fuel at dallbow might be the cheapest at most times except for maybe when reset hits, thats when most players do quests so it is on high demand at that hour. Be sure to look not only on certain rarity as we covered previously that rarity isn't everything, so start from superior for the item you are looking for, you will be amazed how many items are sold at 30-150 that can be used till you even reach lvl 15+ or 20 incase you bought them at high lvl req 12-14, also you can resell them for high price. Ammo prices is the most common problem people can't avoid, yet again, you will have to check the 3 different outposts as prices are different, dallbow for example at this time "24th sept 2018" has price of magnum at high price compared to other outposts. Keep checking the market every now and then for different items especially clothings, even if you're not looking for any, you may hit the jackpot. Good place to find some of the great items or loot is also Dead Frontier 2 discord channel in trade section, but be aware, it if FULL of resellers / sharks, who would offer dirt for your item and resell it infront of your eyes for the price it deserves, so you need to know how much the item worth depending on the stats it have. - % incoming damage (aka damage reduction). Find Elite / Find Ammo. Note: The lower the item level and the higher the stats that will make the item worth much more, as people want for example to stack exp % more at lower level as fast as they can, so the faster they can equip the item at lower level, it is the best, the rest depends on how high the stats are, along with the lvl requirement but not as much. Actually that doesn't apply to all quests, and I can speak of that from personaly experience, only quests that can take up to 10-15mins maybe 20mins max, are the ones that have literally deep floors like coopertown apartment, only if you're unlucky finding it, or RNG was so bad. But let us explain bit by bit what you need to do to fasten the quests part a little bit. There are different types of quests to begin with, so let us just mention each part and explain them one by one. 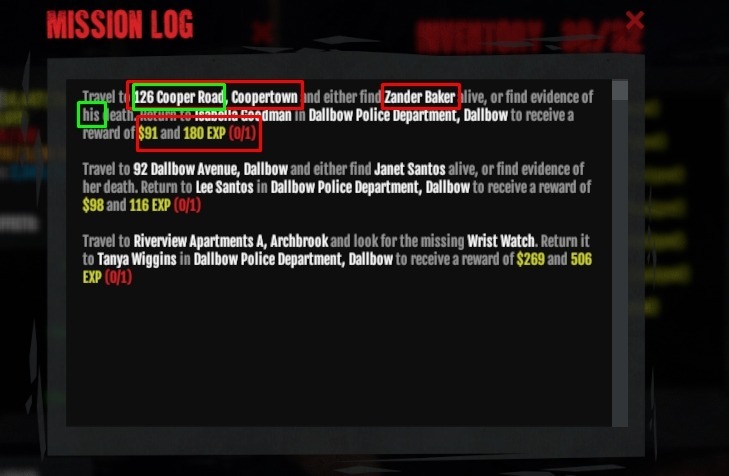 Kill X zeds on street, where X is less than 30 most of the time or below 20. Kill X zeds in building, where X depends on the location, big buildings always 100, small ones, below 30, mostly 21 or 23 zeds. NPC needs X item, where X can be burns kit, anti biotecs, mostly medical items, along with water. These are set in fixed locations, but unknown for player, so a little exploration needed till a player find out where are the exact location in the building and inform others. This one and after personal research and taking notes i finally can say they are fixed into 2 things, lootable dead bodies (not the ones where you kill them to get items) and lootable tools, boxes, shelves, drawers, desks etc. So these ones you don't need to kill any zeds for them, this will save you time from killing zeds and so on. This one is a bit tricky, that person can be either dead or alive and you may need a bit or ALOT of exploration to do, but always start from first floor (Ground floor) and make sure you don't miss a door, or leave a key behind, as sometimes keys are critical for your mission. 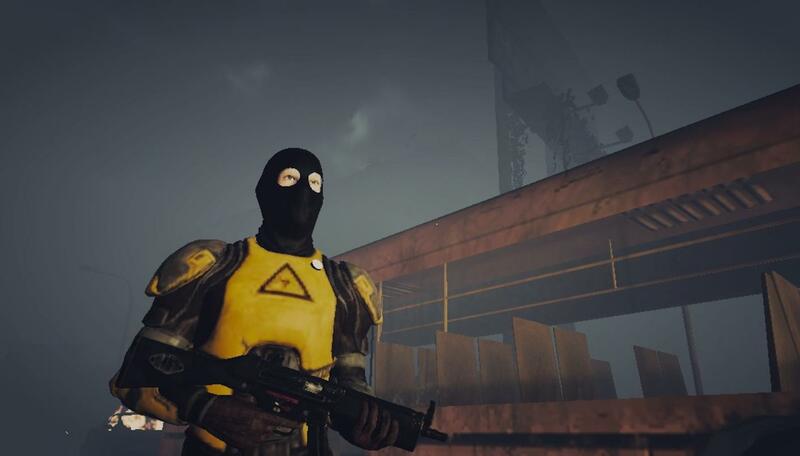 These npc's mostly found in small buildings or big buildings and are considered as bonus missions. just make sure you have burns kit, anti biotecs, bandages, water in your bag incase you found one. just to be prepared, if not and you want to save space in ur bag, make sure you remember where the npc was and get back to them later on with the item they need. What to look at in the quest so you can finish them fast or at least have a hint on what are you up against? The location, gives you 2 info, 1st one in red and a part of it in green, why? because this tells you it is a quest in said location, but it is also a small building, one of those which also contains a boss. 2nd info is the person's name, if you are good with English and the names you will know if they are male or female, but we are not perfect, so there is also an info which specify that and says "his" if male, and "her" if female. 3rd and last info is the exp and money, fast missions give around 80-260 xp depending on outpost, dallbow is between 80-130, harver 100-200, greywood 150-280-ish, high exp rewards which are 450+ up to 1k+ are given to the locations which are for big buildings with 3+ floors at least. And how will this helps? once u enter the building start shooting only what u are looking for, male or female zombies depending on your quest, you can rush through quests faster than Usain Bolt, by saving ammo and time. With these solid info you can make sure what to look for and where to look at it.